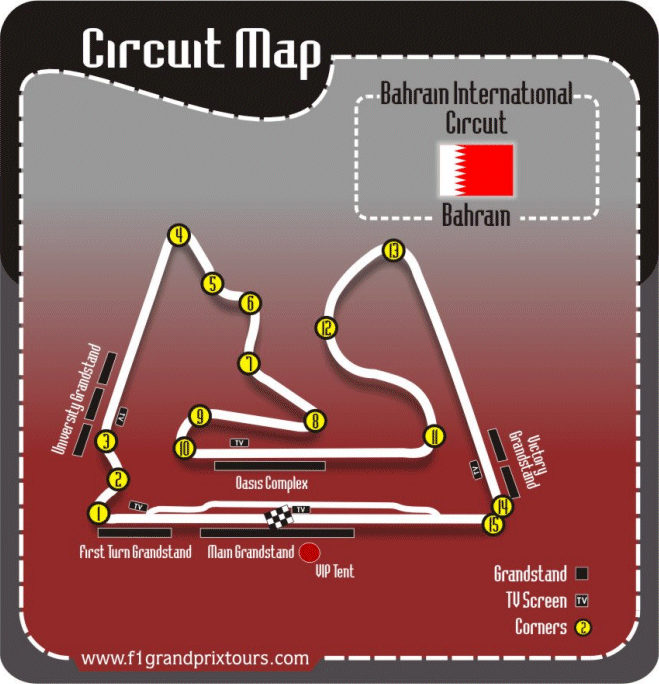 Detailed Bahrain F1 seating information on all grandstands is set out in the Bahrain Grand Prix circuit maps below. The seating on all grandstands for the 2019 Bahrain F1 Grand Prix is covered – it is however still recommended to prepare for all weather conditions e.g. sunscreen, umbrellas, hats, etc. All the Bahrain Grand Prix grandstands, offer superscreen viewing. Usually tickets for the more popular grandstands, like the Main and Batelco Grandstands tend to sell out first for the Bahrain F1 Grand Prix. Before considering the most appropriate package that best suits your 2019 Bahrain F1 Grand Prix needs, it is important to consider the location and benefits of each of the 2019 covered grandstand tickets available. We suggest that you refer to the detailed grandstand information below and attached Bahrain circuit maps to further assist you in making the best choice. In general the Bahrain Main Grandstand offers you great viewing of the start and finish of the Bahrain Grand Prix, all the pit activity before and during the Bahrain Grand Prix and the on track activities before the start. However as a result of the pit buildings and Batelco Complex directly behind it, not much of the rest of the track is visible from the Main Grandstand sections, directly opposite the pit complex. In this regard the Batelco Grandstand offers you a more panoramic view. The covered Main Grandstand is located on the pit straight and faces the pit area, which means it presents a view of the teams and their pit activities. It also means that you will see the start/finish of the race from the green light to the checkered flag, as well as have a clear view of the podium ceremony. A superscreen is also located here enabling you to follow the entire race and not loose track of the procedures. The stand has a seating capacity of 10500 and block H can accommodate wheelchairs. Situated at the end of the pit straight just before Turn 1, a really exciting corner, especially on the opening lap. Turn 1 is a potential overtaking point because it is slow and comes at the end of the long pit straight. This covered grandstand has a seating capacity of 7500. Apart from seeing the first three corners, the Turn 1 Grandstand also presents you with a good view of the main straight and a distant start-finish line. The Turn 1 stand also features a bigscreen, which for obvious reasons makes all the Grand Prix programs so much more enjoyable. The covered University Grandstand Complex with a seating capacity of 7500 spectators, consists of three separate covered grandstands and is located opposite Turn 2 and 3. A short burst of power takes the racing cars from Turn 1 into the left-hander Turn 2 and the drivers keep one the power throughout the corner as well as through Turn 3, a slight right-hander. The very exciting Turn 1, as well as Turn 9 & 10 and the back straight (on the opposite side of the track) can also be viewed from these stands. A bigscreen is visible from these stands, which makes it so much easier for you to keep track of what is happening later on during the race. Situated at the start of the back straight, the covered Batelco Grandstand offers excellent panoramic views of the track, including sections of both the “desert loops”, Turns 8, 9 & 10 as well as the full back straight. Turn 8 is a right-hand hairpin offering some definite overtaking opportunities under hard braking. This corner is followed by a double turn right-hand hairpin Turn 9 & 10, from which the exit speed will be crucial to be carried all the way along the back straight. The stand with a capacity of 3500 spectators also features a bigscreen, which is located directly opposite the stand, enabling you to follow all the racing programs and not loose track of the procedures. Located just before the last corner of the circuit, a double right-hander, the Victory Grandstand has a seating capacity of 5000. In the past the Victory Grandstands were know as the “Last Turn Grandstands”, and the complex consists of two separate grandstands split by the drag strip. The approach to this last right-hander Turn 14 & 15 is quite a steep downhill. The racing cars will be traveling very quickly when the drivers hit the brakes and, when the tires start to go off, this corner makes for some exciting racing onto the pit straight. This grandstand also presents you with a view of the last section of the back straight and the long and fast left double-apex Turn 11 (on the opposite side of the track). A bigscreen can be watched from this complex to enhance your Grand Prix experience even further. The F1 Village is located behind the Main Grandstand area and team merchandise is on sale within this area, as well as some interesting displays from the tire manufacturers and other F1 related suppliers. It features pleasant grassed areas, palm trees, coffee shops and restaurants. The village is accessible from every grandstand, with the use of the free shuttle bus service around the circuit. Walkways and shuttle buses – all grandstands are linked by tarmac walkways and shuttle buses that run back and forth throughout the day, linking the furthest grandstands to the F1 Village. Food and beverage the organizers provide for a selection of food and beverages, at various outlets located within all the grandstands, but obviously at a rather steep price. Please note that no alcoholic beverages are sold at the circuit, and also cannot be taken into the circuit area. Bahrain circuit radio broadcasts in English throughout the race weekend and the live commentary is very helpful to follow the race. Once the pit stop phase commences it sometimes becomes rather difficult to determine track positions of the various cars on different pit stop strategies. So make sure you take a small portable FM radio and earphones along in order to use this nice to have service. For more detailed information on all the F1 Grand Prix racing programs and more specifically for the 2019 F1 Bahrain Grand Prix event program, please visit the Bahrain circuit information race programme page.